Partial Port Sales are here! Hello collectors and sellers! Over the past few months we’ve been working hard to introduce and refine new features on the site, many of which have been suggested from COMC users. One of the top items on our “By Request” list is the ability to offer partial port sales, and we’re happy to announce that this feature is now live! A portfolio sale is when a user sells all of the cards they have listed as “for sale” in their account as a single large transaction, usually at a significant discount. In the past, COMC users have been able to offer port sales through our old Classified Ad feature, but it was an all-or-nothing affair. Until now there hasn’t been an easy way to limit your port sales to individual categories or eras. Through the Promotion creator, COMC users can now offer port sales that are limited to a particular category, a specific year range, or both. 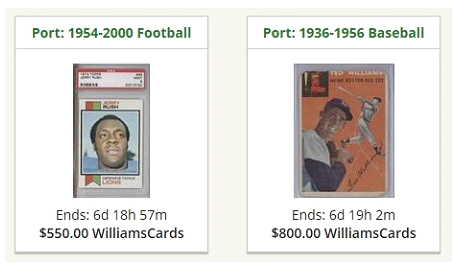 For example, the Port Sales section of our Promotions page currently lists four partial portfolios from user WilliamsCards: 1954-2000 Football, 1936-1956 Baseball, 1957-1970 Baseball, and 1972-2011 Hockey. Sellers can still offer their entire port for sale if they prefer, but the ability to also define smaller, more specific partial ports will enable them to target collectors of a particular category or era who may not be interested in an entire inventory. Also, while all listed ports will be able to field offers as usual, sellers will now also have the option to include an instant-purchase price. sales instant upon seller approval. In the past, large port sales have slowed down and, in some extreme cases, even stopped the entire site. The ability to now break down large ports into more profitable and manageable partial portfolios will improve everyone’s experience. We encourage all COMC users to go to the Promotions page and browse some of the new port sales to get an idea of how the new process works. The link to create your own port sale Promotion is in the upper right section of your dashboard’s Manage Inventory page — we’ve tried to make the process as simple and self-explanatory as possible, and we expect to continue to improve it with your help. We hope you like this new addition to COMC and, as always, we appreciate your feedback. Yes, this is what I hoped for as well. From what I see, I need to choose one variable and list. For example, if I want to offer a port sale for all my Football cards, I can do it, but if I want to do Football and Basketball, I can not? Also what if I want to list a port for my BK cards, but don’t want to include Jordan, shy of making him not for sale, is there an option to exclude portions? Also, is there a way to chose only cards listed after a certain date? I think this is a great step in the right direction, but I think we still need a bit more control. My next port sale will likely be for portions of my Baseball cards, but it will be mostly the stuff I listed in August, I don’t want to offer all of my BB cards in a port. Is this option available? What I would like is to be able to create a port sale based on batches or time on the site. For example, I might take my 10 oldest batches of cards that are still in inventory and move them in a port sale since those have been listed at “retail” prices the longest and still have not sold. I like the partial ports – definitely a step in the right direction.